Electric car startup NIO is flush with cash and is riding high right now, having just launched its first crossover in China in December. If all goes according to plan, NIO intends to start selling a car to the U.S. by 2020, but that won’t happen through a dealership network. It wants to sell to customers through a smartphone app, reports Automotive News. 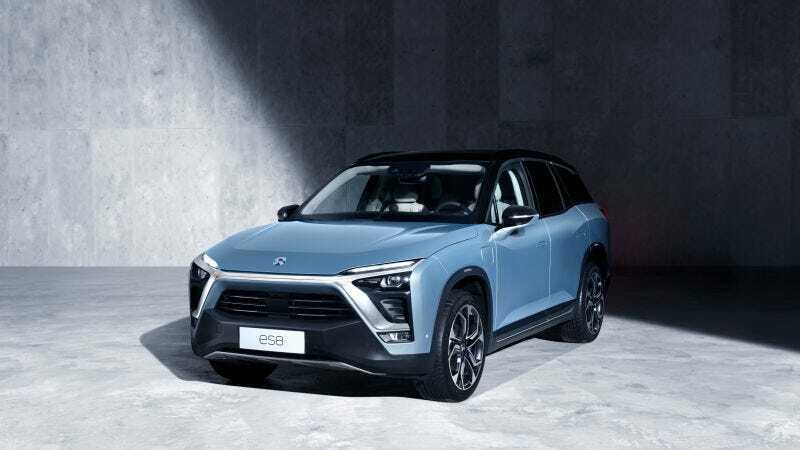 NIO’s first model, the normal-looking ES8, already has decent specs to tout: the seven-seat crossover is expected to start at $68,000, comes with a 70 kWh battery pack that carries a range of 220 miles, has 644 horsepower, and it’s supposed to do 0-60 in 4.4 seconds. But the company’s taking an even more unusual approach than Tesla’s direct sales model. In China, NIO is selling the car through a mobile app, reports Automotive News. Few people are accustomed to buying cars outside of the traditional dealer environment, but maybe this could work at the market NIO’s aiming to attract. The ES8 certainly is tech-forward, so it should reel in buyers who know their way around a smartphone. Inside the ES8, there’s an AI digital assistant called NOMI, which is supposed to aid drivers during their commute. And NIO says it has a quick battery-swapping system in place, that can change the ES8's power pack in three minutes. (As we’ve said before, battery swapping is great in theory, but it’d be an incredible feat to pull off. NIO has said it’ll build 1,100 battery-swapping stations by 2020, so it’s at least apparently aware of what’s needed to make it work. The company also made a point this month to show it’s not messing around and wants to be a prominent player in the EV market, having launched its first EV service center in Beijing—right next to a Tesla service center.